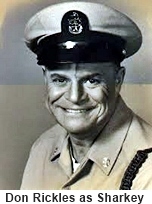 This sitcom was written for Don Rickles whose humor mostly centers around racial and ethnic slurs. 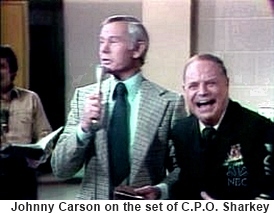 Rickles plays C.P.O. Sharkey who has a sharp tongue for any ethinicity that’s not his own or any superiors that he has to answer to. 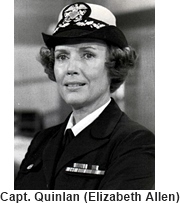 He is a seasoned Chief Petty Officer in charge of new recruits at the San Diego Naval Base. The humor stems from his one liners to the new recruits who are racially diverse. They consist of: Recruit Daniels (Jeff Hollis) a black American, Recruit Kowalski (Tom Ruben) a polish American, Recruit Skolnick (David Landsberg) a Jewish American, Recruit Rodriguez (Richard Beauchamp) an Hispanic-American and Recruit Mignone (Barry Pearl) an Italian American. Although Sharkey it seemed was almost constanly yelling insults at his recruits he really had a heart of gold and helped them adjust to their new lives and out of the jams that they inevitabley got into. 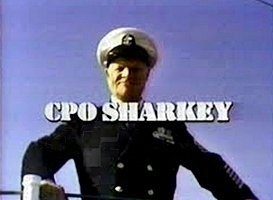 In season two Sharkey’s commanding officer, Capt. Quinlan (Elizabeth Allen) was a woman but he treated her with respect, (Rickles comedy routine was always woman friendly, he just attacked everybody else! ).